Tourism Minister Kelvin Davis and China’s Minister of Culture and Tourism Luo Shugang with officials at the official launch of the year of tourism programme. Photo: RNZ / Laura Dooney. 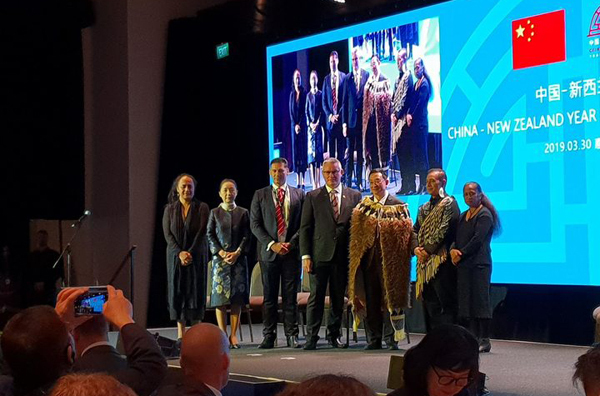 The delayed launch of the 2019 China-New Zealand tourism programme has taken place at Te Papa museum in Wellington today. The programme was launched by Tourism Minister Kelvin Davis and China’s Minister of Culture and Tourism Luo Shugang behind closed doors at a special ceremony today. The official opening ceremony for the programme was planned to take place last month, but was delayed. The delay was put down to scheduling, but many including the opposition party National believed it was because the relationship between the two countries had soured. The Chinese technology firm Huawei had been blocked from helping build a 5G network in New Zealand after the GCSB identified security concerns. But Tourism Minister Kelvin Davis said at Te Papa this morning that the relationship between the countries is very strong. He said initiatives would be discussed that could help increase the number of Chinese visitors to New Zealand to 800,000 over the next five years. Mr Davis said there was also a focus on encouraging more New Zealanders to visit China. Luo Shugang said tourism was a driving force for mutual understanding and friendly ties. Prime Minister Jacinda Ardern this week also announced an official visit to China, leaving tomorrow. The visit had been delayed with some commentators pointing to strained relations. The visit had to be cut to a whirlwind one-day trip because of the terror attacks in Christchurch two weeks ago.